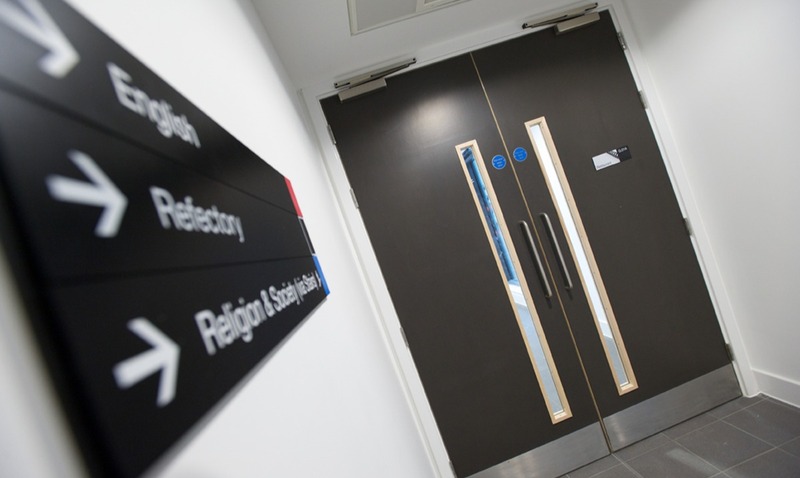 Doors and doorsets in schools and colleges have many unique requirements which can appear daunting for specifiers unless they have the appropriate guidance. With around a third of our total business coming from the education sector, Leaderflush Shapland has a wealth of relevant knowledge and experience and can provide cost effective, rationalised doorset solutions that consider the latest legislation and guidance whilst satisfying a wide range of technical performance requirements such as fire resistance, smoke control, sound reduction,security and infection control. The education sector’s complex needs have been the catalyst for many of our product innovations. For example, as a direct result of our involvement in the building of the co-located Newfield and Talbot schools in Sheffield, Leaderflush Shapland developed ‘Envision’ which allows any image or design to be back-printed on a hardwearing 2mm translucent door facing. Envision can be specified for use on any doorset within the Designer, Plasformand Extended Performance ranges, transforming an everyday feature into a unique focal point. These ranges can also help to raise the standards of hygiene within schools by controlling the spread of infections through a highly effective anti-microbial additive - Hygienilac - which kills harmful species of bacteria such as e.coli and salmonella and is incorporated as standard within the lacquer on all Leaderflush Shapland veneered doorsets. Hygienilac has also been incorporated throughout the complete 2mm thickness of Hygieniform, a high impact PVC whose durability and robust qualities make it suitable for ‘severe duty’ applications such as schools and even if the surface is scratched, Hygieniform retains its antimicrobial properties. ROSPA reports that 30,000 children trap and seriously injure their fingers in doors each year and more than 1500 of these children will need surgery. Sentinel is Leaderflush Shapland’s effective and unobtrusive solution for preventing hands and fingers from getting into the hinge area of the door without compromising performance. Further innovations include EnduraCor, Leaderflush Shapland’s engineered performance doorset core whose durability and strength is especially suited to withstanding harsh environments. Independent testing showed EnduraCor to be 100 times more durable than multi-layered chipboard cores. This highly cost-effective solution could significantly reduce ‘whole life’ repair and maintenance costs and, as EnduraCor is manufactured using sustainable materials, it can also help specifiers achieve an ‘excellent’ BREEAM rating when ordered as FSC. Over the last 12 months, Leaderflush Shapland has manufactured nearly 10,000 doorsets for education projects alone including Ravensbourne and Bideford colleges - both 2011 RIBA awards winners – and for the Hull and Derby BSF programmes.